Can you believe it that just 30 years ago boarders simply weren’t allowed at the resorts? January is Learn to Ski and Snowboard Month. Take advantage of the deal resorts offer and go out there to conquer the slopes. If you want to try a new sport this winter you have plenty of options. But before you graduate to ice climbing and snow camping, you should consider more standard recreational activities such as skiing or snowboarding. The latter has been growing in popularity over the years. Many teenagers now are expert snowboarders but have never been on ski. 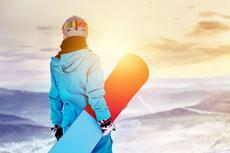 Snowboarding is now seen as a cool sport – maybe because it combines speed, height, and style – every bit as valid and worthy of space on the slopes (and in the backcountry) as skiing. There are clubs, international competitions and, obviously, a whole lot of gear. The action sport is now among the most favorite Olympic events. According to Rant Sports, it’s one of the most exciting disciplines and Sports Illustrated featured it in their No. 1 and No. 11 spots (snowboard cross, a subcategory of the sport, got its own special shout out) in their list of the most popular. Though boarders are now welcome at all but a handful of North American mountains, some resorts are better than others. From downhill terrain to park and pipe, on-mountain culture to the après scene, snowboarders should expect excellence from the mountains they frequent. Click here to see 15 of the absolute best resorts for snowboarding in the U.S.